A lumbar puncture test or spinal tap is the process of extracting Cerebrospinal Fluid (CSF) from the lower end of the spine. The Cerebrospinal Fluid is a liquid that surrounds and cushions the brain and the spinal column. Analyzing this liquid can help doctors detect the cause of diseases that affect the central nervous system. The brain and the spinal cord are extremely sensitive parts of the human body. To protect them and to keep them functioning normally, they are surrounded by a membrane called the meninges. Inside this membrane, a liquid called the Cerebrospinal Fluid (CSF) surrounds the spinal cord and the brain. This provides further protection, cushioning the region against any form of shock. The manufacture, re-absorption, and replenishment of CSF is a continuous process. During the Lumbar Puncture Test, Cerebrospinal Fluid is collected. The body continually manufactures CSF from blood plasma. This CSF eventually gets back into the bloodstream and gets reabsorbed. Newly formed CSF replenishes the CSF lost through re-absorption. A Lumbar Puncture is the procedure for extracting CSF for analysis. After the lumbar puncture test is carried out, the composition of the CSF is studied for the diagnosis of various neurological conditions. Local anesthesia is administered before the lumbar puncture test, and a small amount of CSF is collected through a needle. By attaching a thin plastic tube to the needle, the pressure of the CSF can be monitored. After gauging the pressure, the CSF that flows out through the hollow needle is collected in sealable test tubes. The needle is withdrawn when an adequate amount of CSF has been extracted. The fluid thus obtained is sent to the lab for analysis. Why Do Doctors Tap Into The Lumbar Region? The lower back or the lumbar region is chosen for a specific reason. The spinal cord ends several inches above the lower end of the spinal canal. This leaves a space where the CSF can be extracted safely without risking the chance of an injury to the spine. This is mainly why doctors collect CSF from the lumbar region. What Can A Lumbar Puncture Test Help Detect? Critical Infections: Fungal, viral, or bacterial, like Meningitis, Syphilis, and Encephalitis. Analyzing the CSF is the best way to detect diseases like meningitis, and for this reason, the lumbar puncture test is a vital diagnostic tool for detecting critical disorders and diseases of the central nervous system. Of course, the procedure must be preceded by proper lumbar puncture preparation measures so as to avoid any potential lumbar puncture side effects. The diagnosis of diseases related to the brain and spinal cord might require a study of the composition of the spinal fluid. Performing a lumbar puncture allows the doctor to extract a sample of the spinal fluid for analysis, and this is essentially the need behind the practice. A Lumbar Puncture is the process of inserting a hollow needle into the spinal canal, between two vertebrae. It is done to extract Cerebrospinal Fluid from the lower back, for diagnostic purposes. The fluid extracted is analyzed to diagnose certain medical conditions like meningitis. In rare cases, a Lumbar Puncture can also be used as a therapeutic procedure. Cerebrospinal Fluid is a clear and colorless liquid, and this fluid surrounds the brain and the spine. It provides buoyancy to the brain, and acts as a shock absorber. It delivers nutrients to the brain and removes waste. As it flows between the cranium and the spine, it compensates for fluctuations in the blood volume within the intracranial region. 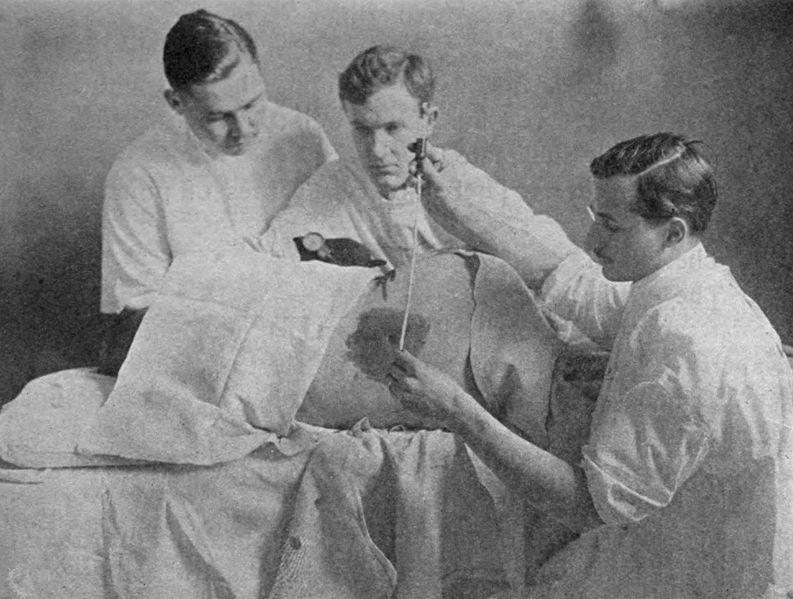 The Lumbar Puncture was first performed by Dr. Heinrich Quincke, of Kiel, Germany, in 1891. He initially performed this procedure to drain excess fluid from around the brain. This was done as a treatment for hydrocephalus in babies. Soon, though, Dr. Quincke recognized the potential use of analyzing the extracted liquid (CSF) in detecting the causes for other disorders that could affect the brain and the nervous system. Traditionally, the main use of a spinal tap as a diagnostic procedure has been to diagnose meningitis. This is a dangerous infection, but if it is detected on time, it can be treated. Why Is A Lumbar Puncture Performed? The most common reason for doing a Lumbar Puncture test is to diagnose meningitis. The CSF is analyzed to see if the bacteria responsible for causing meningitis are present. This procedure can help in finding the cause for inflammation or bleeding in the region of the spinal cord or the brain. It also helps diagnose other brain and spine related diseases like multiple sclerosis or Guillain-Barre Syndrome. A Lumbar Puncture might be used to administer anesthesia into the cerebrospinal fluid (CSF). This is done in the treatment of leukemia and other types of cancers related to the central nervous system. 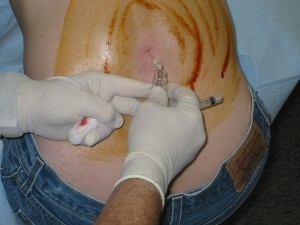 This procedure is used to insert a dye into the CSF. This cerebrospinal fluid is clear and colorless. By inserting a dye, it can be made visible in X-Ray images. This is done to determine if a disc or a cancerous growth is obtruding into the spinal canal. On rare occasions, a spinal tap or lumbar puncture can be used as a therapeutic treatment. This procedure could be used to lower pressure on the brain by draining excess CSF. The Lumbar Puncture is a well-known diagnostic procedure and when it is performed under sterile and safe conditions, the risks involved and the lumbar puncture side effects can be minimal.